Late on April 1, the crown jewel of the Department of Energy's Thomas Jefferson National Accelerator Facility ("Jefferson Lab") sparkled its way into a new era. Following an upgrade of the Continuous Electron Beam Accelerator Facility, the CEBAF accelerator delivered the highest-energy electron beams it has ever produced into a target in an experimental hall, recording the first data of the 12 GeV era. The machine sent electrons around the racetrack three times (known as "3-pass" beam), resulting in 6.11 GeV electrons at 2 nanoAmps average current for more than an hour. "This achievement is a major milestone in the commissioning of the upgraded CEBAF," said Hugh Montgomery, Jefferson Lab director. "Although it's early yet as far as delivering beam for experiments, we are beginning to see the flowers that will become the fruits of our labors from this upgrade." The CEBAF accelerator is a superconducting accelerator that had been designed to circulate electrons through one to five passes through the machine to deliver electron beams with maximum energies of 4 GeV, or 4 billion electron-volts. These beams were then delivered into one of the lab's three experimental areas, called halls, where they were directed into the nuclei of target materials for nuclear physics experiments. The original CEBAF provided its first electron beams to a target in an experimental hall in 1994. Due to efficiencies in the original design and experience gained by the operators in running the machine at its maximum potential, the original machine eventually achieved operating energies of 6 GeV. In 2008, construction began for doubling the energy of the accelerator to 12 GeV. The 12 GeV Upgrade is a $338 million project that, in addition to doubling the maximum energy of the electron beams in Jefferson Lab's accelerator, also includes the construction of a fourth experimental hall and upgrades to equipment in the existing halls. In the Hall A Counting House, where experiments are monitored as they run, the two graduate students awaiting the delivery of beam to the experimental hall were Longwu Ou, Massachusetts Institute of Technology, and Mongi Diamini, Ohio University. Since the accelerator was shut down for 18 months to complete the machine upgrade, it was anticipated that baby steps would be required to optimize the settings of hundreds of components in order to deliver the higher energy beam. The first electron beams at 6 GeV for 12 GeV commissioning were delivered into Experimental Hall A on April 1 at 4 p.m. for just over 11 minutes. "I wanted a good, solid hour with beam availability at greater than 60 percent," said Arne Freyberger, Accelerator Operations manager and the program deputy on shift. Program deputies determine the priority for the accelerator when it's running. Freyberger's goal had yet to be demonstrated. The accelerator crew on shift also included Crew Chief Mike McCaughan and Accelerator Operators Dan Moser and Brandi Cade. Accelerator Scientist Yan Wang recorded and provided insight into machine performance, and Yves Roblin was the Accelerator Physics Experimental Liaison for the Hall A beamline. The crew tried again. At 7:15 p.m., the electron beam was delivered all the way to the Hall A beam dump. The 3-pass beam ran for only a few minutes before a power supply for the Personnel Safety System winked out, causing the system to fault and bringing down the accelerator. The system performed just as it was designed to in case of such a fault, ensuring that no workers were ever in harm's way. Henry Robertson came in on call to clear up the Personnel Safety System fault issue, so that the team could continue. The team tried again and got beam moving just after 9 p.m. At 9:30 p.m., Freyberger called for the two graduate students monitoring Experimental Hall A to ask them to insert their carbon target into the beamline. Longwu Ou, a grad student at Massachusetts Institute of Technology, and Mongi Diamini, a grad student at Ohio University, complied. Finally, at 10:25 p.m., the accelerator crew sent the first 6.1 GeV electrons into the experimental target and held it there for the next 75 minutes. This graph shows data that were collected from the short run. 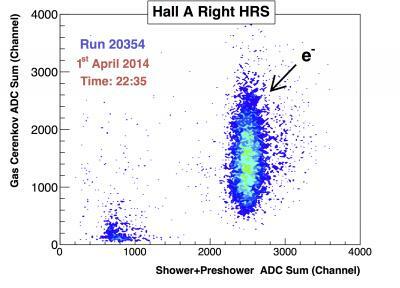 The electrons shown were measured in Hall A's right High Resolution Spectrometer after impinging on nuclei in the carbon target. The run satisfied the requirement for 12 GeV Upgrade Project Level 2 Milestone (2-09) "Hall A Beam Commissioning Complete." The milestone is defined as "events recorded from beam-target interactions using the Hall A spectrometer detector systems with 3-pass > 6 GeV beam energy and at least 2 nA average beam current." "We were here for it, but it really could have been any combination of our chiefs, operators and deputies, because we have put together such a great group of coworkers and colleagues," Freyberger commented. The achievement of this milestone follows a critical accelerator commissioning step that was accomplished on Feb. 5, where electrons were sent around the accelerator at full upgrade energy acceleration of 2.2 GeV in one pass. This was the first run of the CEBAF accelerator at design specifications. The next milestone in the commissioning of CEBAF at 12 GeV is the delivery of a 5.5-pass electron beam with an energy greater than 10 GeV to the Hall D Tagger Facility. The 12 GeV electrons will eventually generate the photon beam for Hall D in the Tagger. Electron beams with energies up to 11 GeV will be delivered to the other three experimental areas, Halls A, B and C. Upgraded and new equipment is being installed in those halls to expand the research capabilities available to scientists. Delivering this beam energy was the first demonstration of beam beyond the original accelerator's operational energy and heralds the first beams for nuclear physics experiments in the 12 GeV era. Those first experiments will provide higher precision measurements of the structure of the proton (Precision Measurement of the Proton Elastic Cross Section at High Q2 and Measurements of the Electron-Helicity Dependent Cross Sections of Deeply Virtual Compton Scattering with CEBAF at 12 GeV) Both experiments will be run in Experimental Hall A.